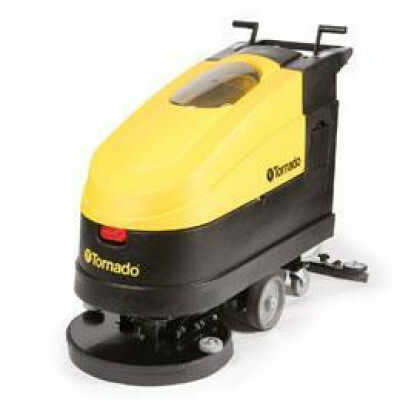 Tornado's EZ Floorkeeper series of automatic scrubbers work great on a wide range of flooring surfaces like tile, linoleum, rubberized surfaces, marble, concrete and more! Built with rotationally-molded plastic, these machines are built to last and will stay a fundamental component in your hard-floor maintenance program for years to come. The EZ Floorkeeper lays solution, scrubs, and recovers dirty water in a single pass to leave your floors clean and dry. EZs are popular in retail settings and are used worldwide in retail store chains, grocery stores, and discount stores. Since the machines operate quietly, are compact in size, and have a front-mounted warning light, stores are able to scrub during business hours when customers are shopping. We also have many other walk behind scrubbers to choose from, so if this machine doesn't fit your needs, we are sure to have something to fit your scrubbing job on hand. Customers who were interested in the Tornado® 99130 'EZ Floorkeeper® 24' Walk Behind Floor Scrubber w/ Traction Drive were also interested in the following items. This is a review for the Tornado® 99130 'EZ Floorkeeper® 24' Walk Behind Floor Scrubber w/ Traction Drive.